Living with Sky-Frame means living in your own special dream home. 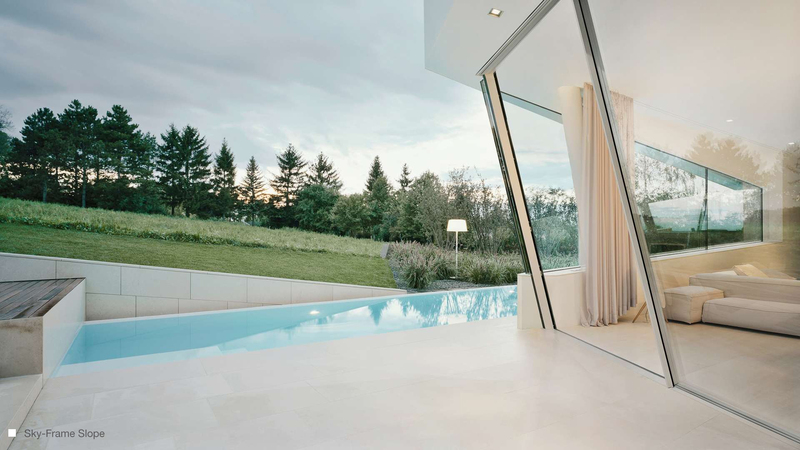 The Swiss made frameless sliding windows are the key to exceptional architectural creations and, thanks to the flush transition between indoors and outdoors, an unbounded spatial experience with spectacular vistas. 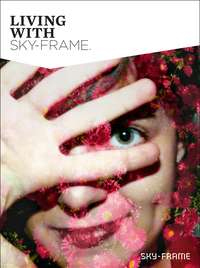 Read about the new Sky-Frame PLAIN hidden transition system, a visually and tactilely pleasing effect. 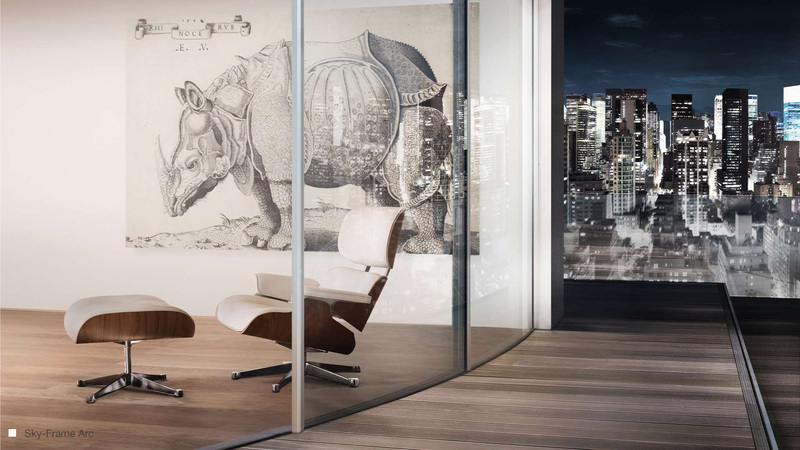 Read about the new Sky-Frame INLINE Frameless fixed glass panels combined with sliding doors over large areas, forming a flush, continuous glass membrane. "Instead of inserting a window into a wall, the whole wall becomes a window". Quote from Beat Guhl, CEO and owner of Sky-Frame. Sky-Frame sliding window systems comprise freely combinable elements that breathe life into any style of residential architecture. The rectilinear, organically curved and inclined glass units of the classic, Arc and Slope systems guarantee a truly distinctive living experience. Even the single-glazed Sky-Frame 1 model offers excellent sound-proofing. the double-glazed Sky-Frame 2 and triple glazed Sky-Frame 3 assemblies additionally meet high thermal insulation requirements. Various add-on features are also available for extra convenience. 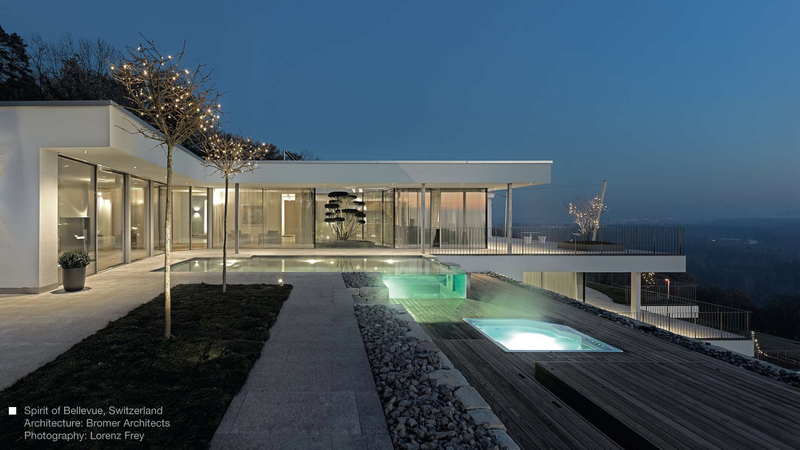 Sky-Frame is a Swiss company which continually sets new benchmarks in window technology. Working in tandem with universities and research institutes, it is permanently engaged the development of innovative solutions. 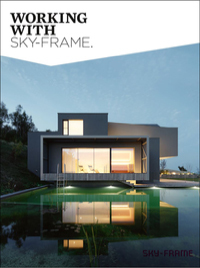 Sky-Frame regularly scoops prestigious design and business awards for its frameless sliding windows. 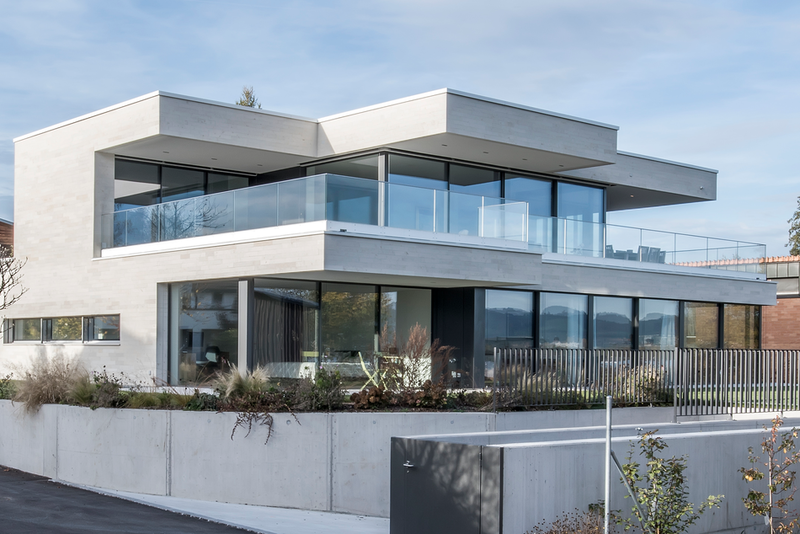 The location of development and production operations in Switzerland guarantees compliance with the highest quality standards. 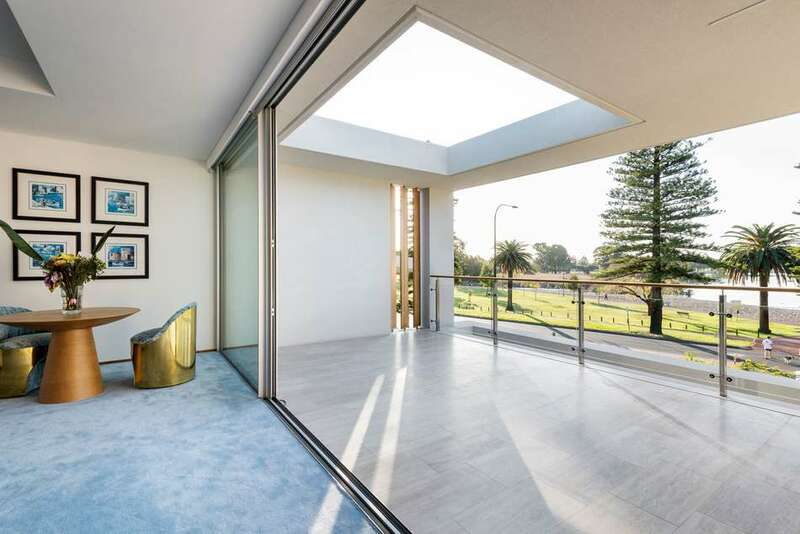 Bretts Architectural Window Solutions are one of the few Australian companies, and the only Queensland company licensed to assemble and install Sky-Frame systems. Sky-Frame delivers premium sliding window solutions for any living situation – whether for urban life in a city apartment or for carefree relaxation in a rural holiday home. As a Sky-Frame licensed manufacturer Bretts offer builders, developers and architects professional advice and support – from conception through to completion of tailored spatial concepts. 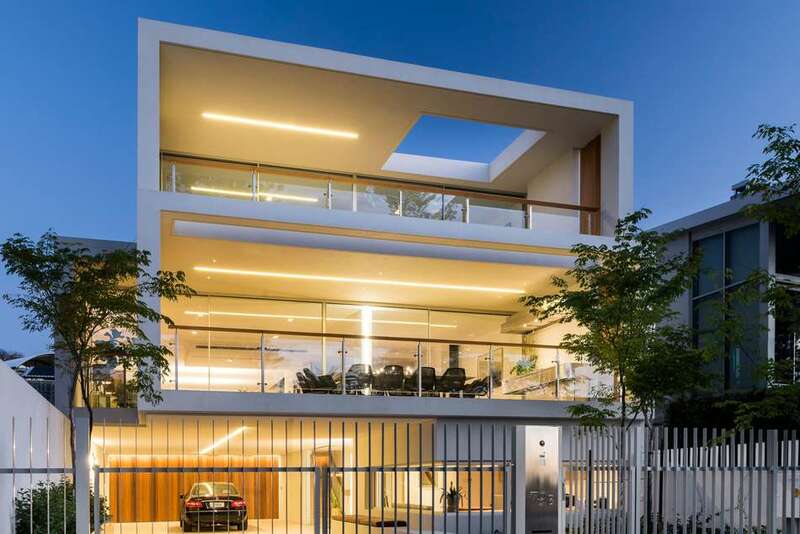 With ceiling-height window fronts, organic curves or sloping glass units, Sky-Frame lays the foundation for customized spatial concepts and outstanding architecture. Inspired by the Bauhaus vision of “free-flowing space”, the flush threshold sliding glass doors open up the home interior. 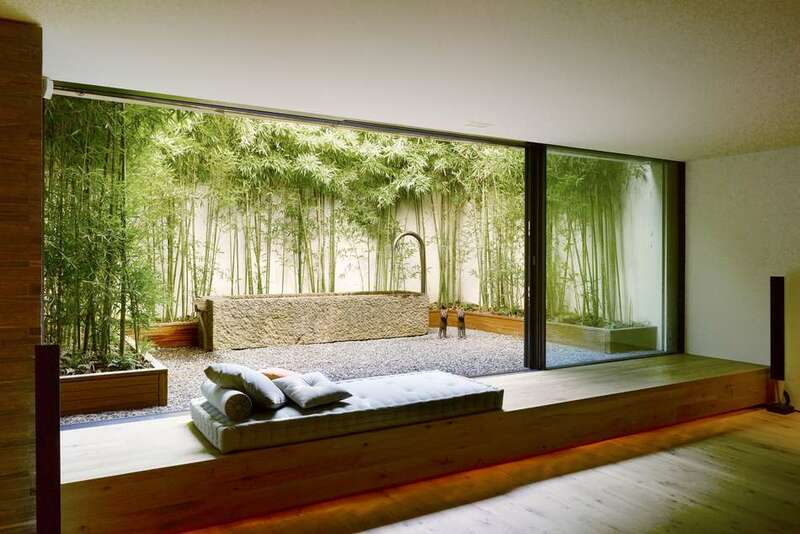 Indoor and outdoor space merges to create a unified living environment. Wall pockets allow the sliding windows to be fully retracted out of sight. The eternal charm of the frameless window concept transforms the view into a spellbinding design feature. The Sky-Frame system includes a range of features for enhanced comfort. The Sun solar shading assembly offers protection against strong sunshine. 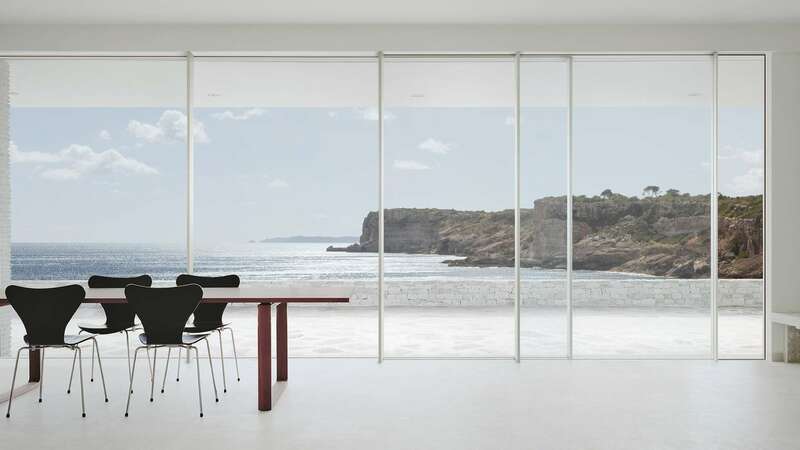 The Fly insect screen allows the insect-free enjoyment of warm summer days and balmy evenings. Automatic drives permit soundless and, if required, remote-controlled operation of the window units. In line with their thermal and sound control requirements, customers can choose between the Sky-Frame 1, 2 and 3 technologies. Sky-Frame sliding glass windows are also designed for high security. Apart from incorporating safety glass, they can be additionally fitted with alarm sensors. As a testament to Sky-Frame’s engineering prowess, the complex technology – though fully concealed – is exceedingly simple to operate. Yet, as in all areas of human endeavour, improvements and refinements are always possible and, for Sky-Frame, this is what drives the unceasing process of product innovation. The demand for progress and sustainable development is firmly enshrined in the corporate vision and reflected by the many innovation awards received by Sky-Frame to date. Sky-Frame technology is 100% Swiss and manufactureed by Bretts Windows and Doors at Geebung in Brisbane. It is synonymous with precision engineering and the quest for supreme product performance. Insect screen - When not in use, the frameless, pleated Fly insect screen fully retracts out of sight into the frame. Tear-resistant tension cords made from Vectran fibre and the integral system section guarantee maximum stability and weather resistance. Fly can cover openings up to 1 m wide. The electric drive allows simple and virtually noiseless operation of the sliding elements at the press of a button. The drive is concealed in the ceiling section and allows the window fronts to move automatically. Thanks to the adhesive bond between insulating glass assembly and GRP sections, and the multipoint locking system, even the standard Sky-Frame model offers outstanding burglar resistance. Various additional components can be fitted to the sliding windows to meet special security requirements. 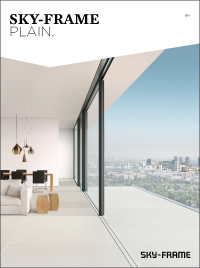 With the Pocket solution from Sky-Frame, rooms can be completely opened up without any visible glass leaves. The sliding elements are recessed and hidden away from sight. Additional features such as Sky-Frame Drive (electrically driven opening and closing) are also available. With special insulated security glass (2-IV with bulletproof glass), reinforced frames and vertical profiles and defined building joints, Sky-Frame 3 Gun ensures optimal protection from gunfire.The Swiss Federal Office for Defence Procurement armasuisse has rated Sky-Frame 3 Gun as FB4, NS (.44 Magnum, no spall). The Sun venetian blind system with its flat, 80 mm wide aluminium slats offers the perfect solar shading solution for the filigree Sky-Frame sliding windows. Plastic-sheathed guide cords carry slats up to 3 m long to a maximum height of 4 m. The Sun-Box recessed into the floor and the winding mechanism in the blind box facilitate swift dismantling of the guide cords to create an unobstructed opening and their subsequent re-installation. Create your own Sky-Frame sliding windows: choose the profile colour and we will bring your vision to life. In addition to the anodized colours available, you can choose any colour from a range of palettes (RAL, IGP, DB) for the powder coating. The name “Classic” not only evokes the timeless appeal of the rectilinear window assembly, but also highlights its historical significance as the first ever Sky-Frame system. The sliding windows comprise insulating glass units with perimeter aluminium or glass-fibre-reinforced plastic (GRP) sections. Mounted in aluminium frames that are fitted flush with floor and ceiling, the sliding units offer minimum rolling resistance when operated. The system drainage for the flush assembly is via recessed channel or is installed below the raised outdoor floor covering. 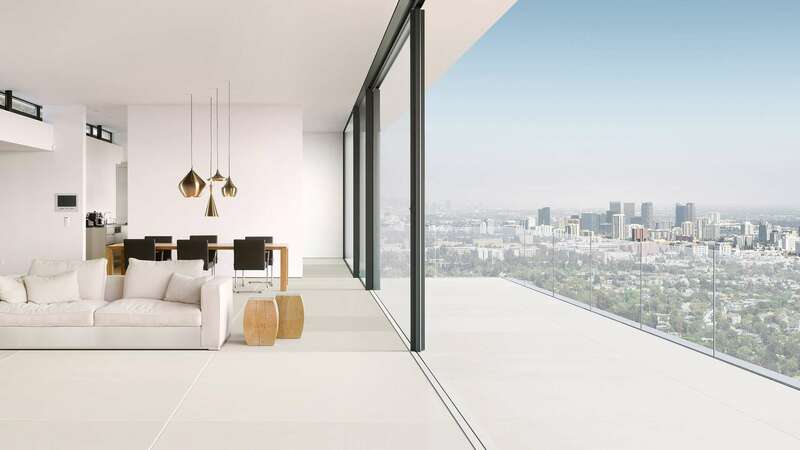 A feeling of vast, wide-open space, even when the windows are shut: the windows are framelessly transparent from the ceiling to the floor, which is made possible by the track system that is fully concealed in the floor. Sky-Frame Original ensures that heat and cold remain outside. 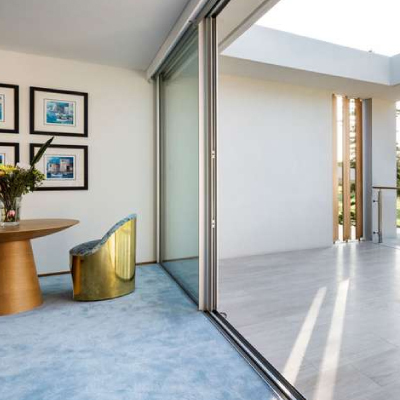 What sets Sky-Frame Plain apart is the hidden, seamless transition between the inside and the outside that is completely flush-fitted with the floor: the sliding window glides over an opening in the floor with a width of just 10 mm. The space between these tracks is covered by the same flooring as the interior of the room, which reinforces the feeling of a free-flowing transition between indoors and outdoors. Sky-Frame Plain is perfect for use in warmer regions. 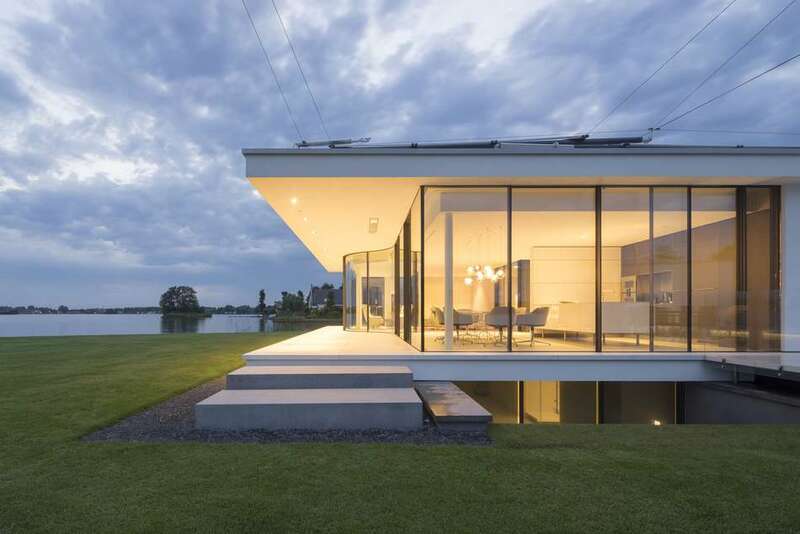 Lakeside Villa, Netherlands. Architecture: Loek Stijnen. Photography: René de Wit. The sliding elements of Sky-Frame Arc are used to create curved glass fronts, adding organic contours to the home environment. The radiused glass units offer smooth running performance and can be equipped with an automatic drive on request. The system meets all Sky-Frame standards and, as a streamline architectural feature, opens up a wealth of additional design options. Sky-Frame Slope sliding windows offer the ability to be installed with an inward or outward inclination depending on requirements. The system meets all Sky-Frame standards while generating a distinctive spatial geometry. The bearing assembly is able to accommodate all vertical and horizontal forces, thereby achieving superior running performance. Regardless of inclination, the system drainage meets all driving rain resistance requirements. 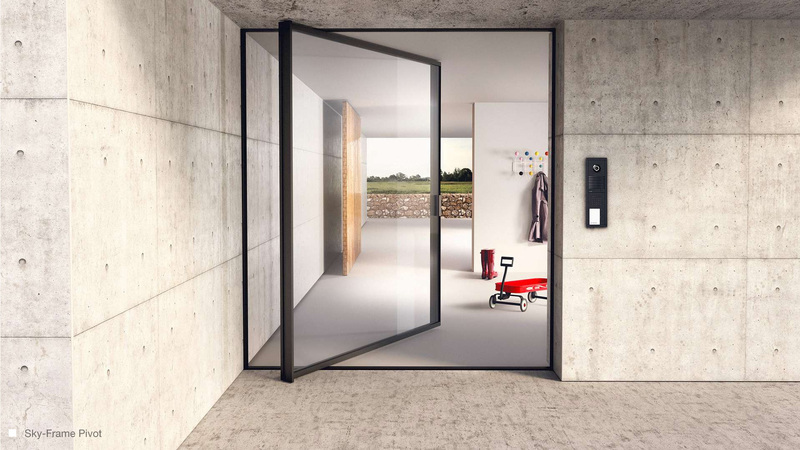 The Pivot system turns opening a door into a creative act: the doors swing around the asymmetrically located axis, creating a temporary spatial structure. With just a gentle push on the comfortable handle on the long side of the frame the door delicately glides open. 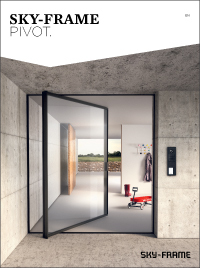 The electromechanical multipoint locking system guarantees safety and security. Pivot comes with either double or triple glazing options. 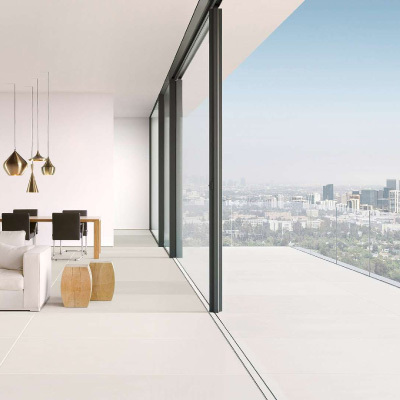 What makes the Sky-Frame Plain so special is the hidden, seamless transition between the inside and the outside that is completely flush with the floor. The sliding window glides over an opening in the floor with a width of just 10 mm. The space between the narrow tracks is covered with the same flooring material as the interior of the room, which enhances a smooth transition between indoors and outdoors. Once the sliding doors are open, this seamless transition creates a visually and tactilely pleasing effect – especially for those who love to go barefoot, both young and old.. The Inline Sky-Frame system is supplemented by the filigree post, which has a minimal visible width of just 30 mm. Frameless fixed glass panels can therefore be combined with sliding doors over large areas, forming a flush, continuous glass membrane. Sky-Frame "A View, not a Window." 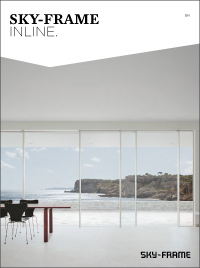 Discover the world of Sky-Frame frameless sliding windows.